Purchased 1889 from the artist by Smith College Museum of Art, Northampton, Massachusetts; (sale, Gimbel Brothers, New York, 1946). Dr. and Mrs. Walter Timme, Cold Spring, New York, by May 1947; bequest 1978 to NGA. Letter from Linda Muehlig, curator at Smith College, dated 4 May 1983 (in NGA curatorial files), states that the painting was bought directly from the artist in 1889. 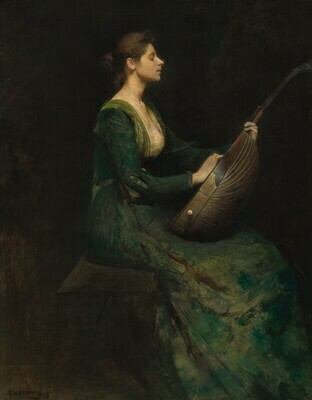 While in the Smith College collection the painting was titled A Lute Player. According to a letter of 30 August 1978 from Susan Hobbs (in NGA curatorial files), Mrs. Timme acquired the painting at the Gimbel Brothers auction; however, in a letter of 16 May 1947 to Frederick Hartt, acting director of the Smith College Art Museum (Smith College Art Museum archives; photocopy in NGA curatorial files), Dr. Timme states that he had "paid nearly three times what Gimbel's had sold it for," which clearly implies there was an intermediary owner. Timme also observed: "The `Lute Player'. . . was thought by many people to be [Dewing's] masterpiece. I have known a number of people both painters and connoisseurs who made a pilgrimage to Northampton just to see that picture. To some people your gallery was known by this picture, if by none other. . . . Some weeks ago a friend of mine, connected with the National (Mellon) Gallery in Washington, came to my home, saw it and asked for the donation of it as an outstanding example of Dewing." Seventh Annual Exhibition of Selected Paintings by American Artists, Buffalo Fine Arts Academy, 1912, 18, no. 51, , repro. no. 43, as A Lute Player. Special Exhibition of American Paintings in Honor of the Philadelphia Museum of Art Diamond Jubilee, The Milch Galleries, New York, 1950, no. 4, as Lady with Lute. The Art of Thomas Wilmer Dewing: Beauty Reconfigured, The Brooklyn Museum of Art; National Museum of American Art, Washington, D.C.; The Detroit Institute of Arts, 1996-1997, no. 29, repro. The support is a Winsor and Newton prepared mahogany artist's panel (1.2 cm thick) with the grain running vertically. The reverse is coated with white and gray paint, on which the colormen's label is adhered. The ground is a moderately thick tan layer. The paint layers were applied thinly in most areas, with some more thickly handled passages such as the woman's throat, bodice, and lute. The more thickly painted areas have a scattered, fine crackle pattern. Overall the painting is in excellent condition, with few losses and minimal abrasion. The varnish has yellowed. Buffalo Fine Arts Academy. Academy Notes 7 (July 1912): 49-51, repro. 50. Handbook of the Art Collections of Smith College. Northampton, Massachusetts, 1925: 15. Smith College Art Museum Catalogue. Northampton, Massachusetts, 1937: 3, repro. 48. Wilmerding, John. American Masterpieces from the National Gallery of Art. National Gallery of Art, Washington, D.C., 1980: 17, 124, no. 43, color repro. Williams, William James. A Heritage of American Paintings from the National Gallery of Art. New York, 1981: color repro. 163, 188-190. Wilmerding 1983, 145, repro. 142. Wilmerding, John. American Masterpieces from the National Gallery of Art. Rev. ed. National Gallery of Art, Washington, D.C., 1988: 20, 144, no. 49, color repro. Merrill, Linda. An Ideal Country: Paintings by Dwight William Tryon in the Freer Gallery of Art. Washington, D.C., 1990: 97, n. 276. Hiesinger, Ulrich. Impressionism in America: The Ten American Painters. New York: Prestel, 1991, pp. 82, 113, 238, fig. 24. Kelly, Franklin, with Nicolai Cikovsky, Jr., Deborah Chotner, and John Davis. American Paintings of the Nineteenth Century, Part I. The Collections of the National Gallery of Art Systematic Catalogue. Washington, D.C., 1996: 127-130, color repro. Koja, Stephan, ed. America: The New World in 19th-Century Painting. Exh. cat. Österreichische Galerie Belvedere, Vienna. Munich, London, and New York, 1999: 46, fig. 7 (not in the exhibition). Muehlig, Linda, ed. Masterworks of American Painting and Sculpture from the Smith College Museum of Art. Northampton, 1999: 10-11, 245 n. 8. Virtue and Beauty: Leonardo's Ginevra de' Benci and Renaissance Portraits of Women. Exh. cat. National Gallery of Art, Washington, D.C., 2001: 14, fig. 2 (not in the exhibition).